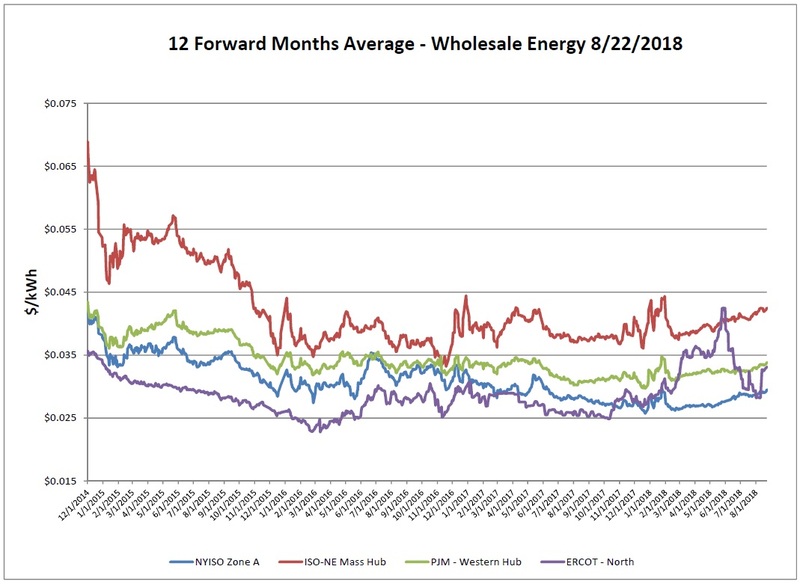 NYISO, ISO-NE and PJM all continue to see a very slow trend upward. Over the last few years seasonal extremes one way or another for both summer and winter months has driven the markets. 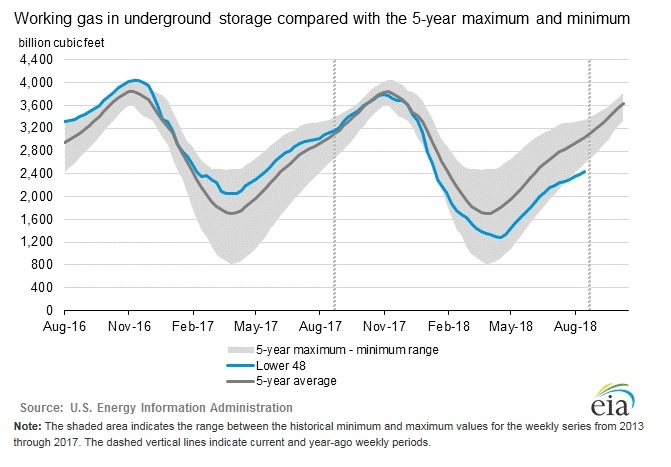 ERCOT is still very unsettled with prices all over the board as the region is trying to determine its position and searching for a comfort level. Recently the EPA proposed the Affordable Clean Energy (ACE) rule as a replacement for the Clean Power Plan (CPP). The new process could allow coal plants to stay open longer, however many coal retirements that occurred over the past few years have been attributed to market economics, rather than regulation requirements. The market impact of the new rule is still unclear at this point. The report week was a bit cooler than normal and the day-ahead market was largely unaffected. We are anticipating to see another week or two of above average temperatures as the end of summer rounds off. The 12-month strip held fairly steady over the week. We’ve been hovering near the $3.00 level for a few weeks now with no success at breaking above that price. In New England, the Algonquin Basis is masking the attractiveness of the forward prices of overall gas. However prices are at lower level of this current range so don’t lose sight of the underlying Henry Hub. 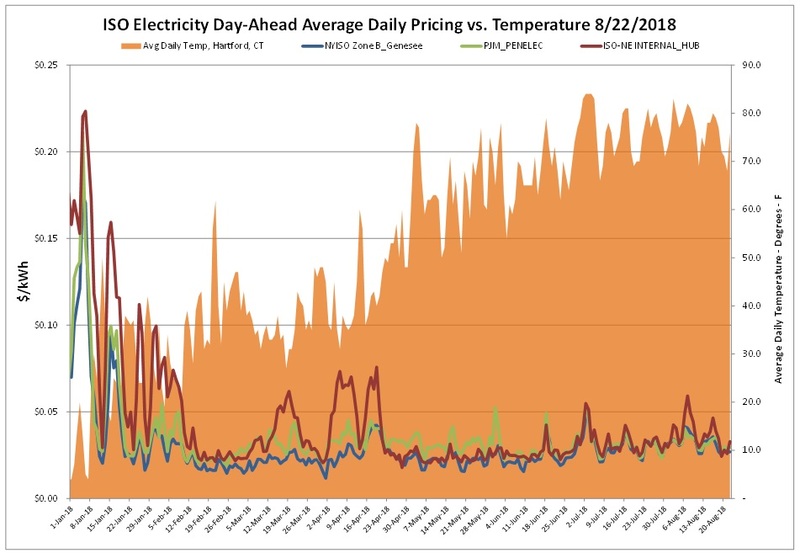 The weather forecasts calling for above-average temperatures for the coming weeks which should lead to higher a/c demand and higher use of natural gas. In turn the trend of low storage injections will also likely continue. The EIA reported a new increase of 48 Bcf as of Friday, August 17, 2018. Total working gas in storage was 2,435 Bcf. Storage injections seem to be stuck in a lull of the same net change week after week. Make note of how low the level of blue line is, as the season moves forward the lower end of 5-year average gap is widening. 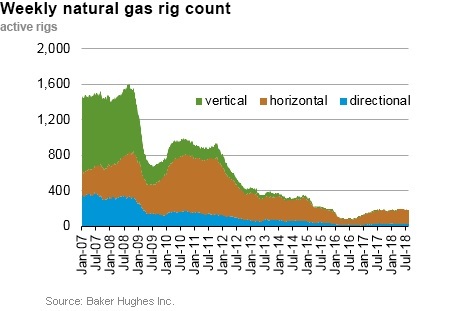 The Baker Hughes exploration gas rig count decreased 4 from the previous week for a total of 182 rigs. The report total is 2 rigs more than were in operation last year when there were 180 rigs. 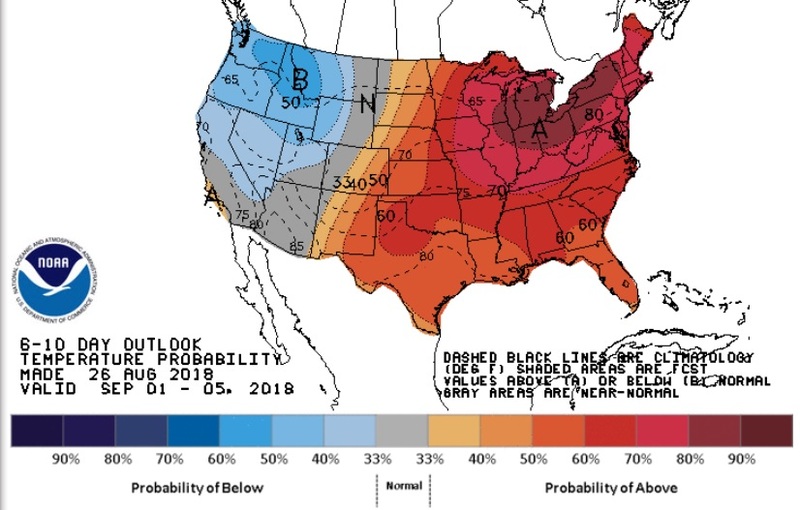 The Eastern two-thirds of the country is expected to see above to much above-normal temperatures for the beginning to mid-September. 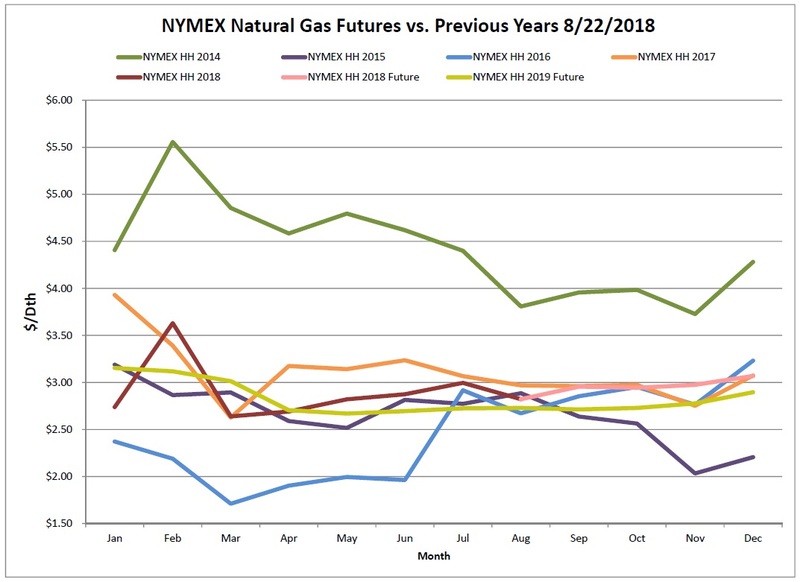 As the NOAA begins to form opinions on the upcoming winter the forecasts will begin to become more relevant to energy prices. Current predictions are anticipating a strengthening El Nino which usually translates into a warmer than normal Northern half of the U.S. The PJM Interconnection asked the Federal Energy Regulatory Commission on Tuesday to allow it to delay its May 2019 capacity market auction if the commission cannot make a final decision on rules for the market by early January. Changes to the EPA’s New Source Review process could allow coal plants to stay open longer — if operators choose them over cleaner technologies.